Dr. Larry Reynolds addresses U-M faculty at UM-Flint regarding the water crisis. Faculty members from all three University of Michigan campuses met at UM-Flint on Friday to discuss ideas for research collaborations and opportunities to work with community organizations responding to the Flint water crisis. 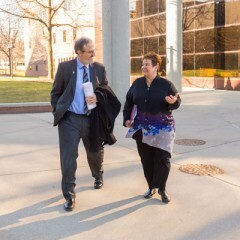 UM-Flint Chancellor Susan Borrego and Provost Douglas Knerr convened more than 140 faculty members at the campus’ William S. White Building. 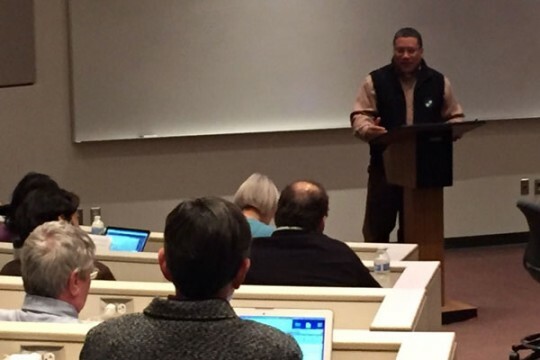 The meeting was part of U-M’s overall response to the Flint water crisis. UM-Flint’s actions include filtering and testing all drinking water on the campus. Donna Fry, dean of UM-Flint’s School of Health Professions and Studies, said the campus’ strengths in applied research provide many opportunities for researchers to work with local experts and existing community partners. “This community wants to be engaged in research with us,” she said. The faculty members broke into groups to discuss research areas that included pediatric and adult health, education and childhood development, policy and government, and infrastructure and technology. They discussed collaborations that could cross campuses and disciplines and match projects to needs identified by those already living and working in Flint. UM-Flint is setting up online tools to foster collaborations and share information. Fry said they plan to reconvene faculty members this spring. She added that UM-Flint’s deans would serve as additional contacts to link faculty from all three campuses and make school funds available for research where available. Lawrence Reynolds, president and chief executive officer of the Mott Children’s Health Center, provided a briefing on the health aspects of the crisis and emphasized the importance of community-based participatory research. Knerr also announced that information about the $100,000 in seed money from the Office of President Mark Schlissel is available to faculty for projects relevant to the crisis. The funds were provided by donor gifts, and proposals will be evaluated by the Office of Provost Martha Pollack. The funds are available to faculty at all three campuses. To be eligible for funding, projects must consist of research that directly focuses on ways to address the Flint water crisis or its aftermath, and must be headed by a faculty member (tenure or tenure track, clinical, or research). The funds may be used for any bona fide research expense, and must be fully expended no later than Sept. 1, 2016. Interested faculty should submit a brief proposal, of no more than three pages, describing their planned project and including a statement of how the funds will be used. An additional page should be used to describe the relevant qualifications of the researchers. Projects incorporating community partnerships in Flint will be given priority, as will those that include faculty from more than one U-M campus. Other evaluation criteria will be qualifications of the researchers, particularly prior relevant research experience; and relevance of the project and likelihood that it will have a meaningful impact, either directly or to establish initial results for subsequent externally funded work. Finally, interdisciplinary approaches are encouraged, where appropriate. Projects of any size—up to $100,000—will be considered, but in general, the expectation is that most projects will be $15,000 or less. The proposals should be emailed to sharrons@umich.edu by no later than the end of the day on Feb. 11 to receive priority consideration. Any proposals received after that time will be considered only if funding is still available after the first round of proposals is received. A streamlined review process is planned. Depending on the number of proposals received, it is hoped that responses will be provided by Feb. 27.